Matt Calkins: Are the Mariners in fact building for a brighter future as they dismantle 2018 roster? UPDATED: Mon., Dec. 3, 2018, 10:04 p.m.
Just as quickly as the Mariners finalized the deal to send Robinson Cano and Edwin Diaz to the New York Mets, the team announced another major trade on Monday, sending Jean Segura to the Philadelphia Phillies. Those three regulars, plus James Paxton and Mike Zunino, will all be playing elsewhere in 2019 as the Mariners move on from an 89-win season that was as much full of hope as disappointment. So a mom, dad and their two kids hop into a self-driving Subaru, zip under some hoverboards on their way to the stadium, slip on their climate-controlled jackets when they get out, devour their drone-delivered hot dogs 10 rows behind the third-base dugout, and get set to watch the Mariners’ first playoff game since 2001. What? Not a possibility? It isn’t feasible that the longest postseason drought in American sports can double in unsightliness over the next decade or two? I’m not saying Mariners general manager Jerry Dipoto was wrong in decimating this roster. I’m not suggesting the smart move would have been to give 2019 a genuine try after an 89-win season. If building a legitimate World Series contender in the next few years is the goal, then this obliteration was the only option. Just know that, as a fan, a teardown is kind of like signing up for a marathon – it seems like a good idea, but you’ll wish you were dead by mile 21. The Mariners officially shipped out All-Star closer Edwin Diaz, All-Star second baseman Robinson Cano, and All-Star shortstop Jean Segura on Monday. This comes after trading No. 1 starter James Paxton earlier this offseason, along with catcher and former No. 3 overall pick Mike Zunino. Set-up man Alex Colome is also gone, as are relievers Juan Nicasio and James Pazos (to the Phillies with Segura) and outfielder Guillermo Heredia. The reasoning behind all this is simple: Dipoto didn’t think this aging team had the goods to compete for a playoff spot next year or a title in the foreseeable future. So he did what he did to get younger and cheaper while replenishing a former embarrassment of a farm system. Well, from the Mets come outfielder Jay Bruce, reliever Anthony Swarzak, 23-year-old righty Gerson Bautista and a pair of gifted prospects – outfielder Jarred Kelenic and right-handed pitcher Justin Dunn. From the Phillies come veteran first baseman Carlos Santana and shortstop prospect J.P. Crawford. 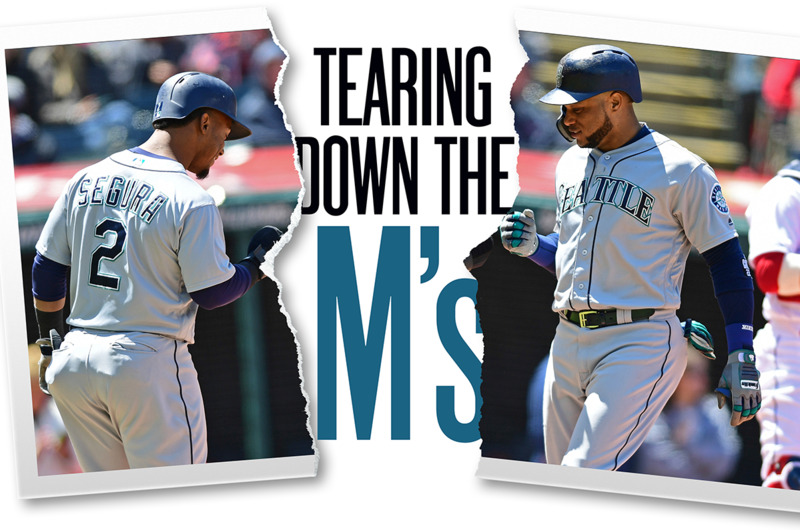 There’s speculation that the M’s will try to flip the likes of Santana and Bruce for more prospects. And Dipoto said Kelenic was the best player in last June’s amateur draft. Crawford, meanwhile, was among the Phillies’ better prospects, although some wonder if the Mariners could have gotten a better haul for Segura. The same was thought of the Mariners’ return for Paxton, which yielded potential No. 2 starting pitcher Justus Sheffield among others. To be honest, I’m not sure there’s a more futile exercise than grading trades for prospects. Nobody knows who’s going to blossom or bust, least of all Dipoto. But it is times like this that I’m thankful for the Seahawks, Huskies, Sounders, Storm and a likely NHL team to keep this town occupied. Because … man – it’s going to be rough on the diamond for a while. Dipoto appears to be targeting 2021 as the potential breakthrough season, but that seems a little soon. Rebuilds typically take at least four years to bear fruit, and even then it’s a coin toss. Sure, the Cubs and Astros each won a World Series after blowing it up, and teams such as the Braves and Phillies seem to be on the cusp of big things. But there have also been teams such as the Pirates, who had 18 consecutive losing seasons, and the Padres, who have had eight straight losing seasons and haven’t made the playoffs since 2006. A couple of thoughts come to mind amid all this movement. 1) Assuming the league approves expansion, is this an opportunity for Seattle’s NHL team to poach Mariners fans? Sure, they play at different times of the year, but if a fan only has so much money to spend on season tickets, might he or she pass on baseball if hockey is a winner? 2) Did Dipoto and manager Scott Servais hit the jackpot with their contract extensions? If someone were to tell then-chairman Howard Lincoln that Dipoto would tear down the team after three years of missing the postseason, I’m not sure he offers him the job. And current chairman John Stanton extended him this summer when it seemed certain the playoff drought would end. Again, I’m not saying Dipoto isn’t acting accordingly, or that he hasn’t made some deft deals here in Seattle. But it’s funny how timing can be a GM’s best ally sometimes. As for what fans should do now? I suppose they just gotta wait it out. Unfortunately, they’ve been doing that longer than any fan base in the country. Published: Dec. 3, 2018, 8:46 p.m. Updated: Dec. 3, 2018, 10:04 p.m.